The performance-based climate mitigation framework REDD+ encourages the reduction of emissions related to deforestation and forest degradation, and removals through enhanced forest carbon stocks and improved forest management. These activities should be measured and reported to the United Nations Framework Convention on Climate Change (UNFCCC) which requires methodologies for estimating actual emissions and removals and for establishing the reference level. UNFCCC requests countries to build robust and transparent national forest monitoring systems to facilitate the measurement and reporting of forest related greenhouse gas (GHG) emissions, following the guidelines and guidance from the Intergovernmental Panel on Climate Change (IPCC). Various training materials and tools are available that aim to support and facilitate country processes with the development of capacities for implementing a national system for monitoring forest area and area changes, the associated carbon stocks and changes; and for measuring, reporting and verification (MRV) of REDD+ activities. To make these materials more accessible for countries and REDD+ / forest monitoring professionals, four (4) regional one week workshops are planned in three different continents: one in South-East Asia (in English), one in Latin America (in Spanish) and two in Africa (in French and English). The basic concept of these workshop is to �train the trainers�. 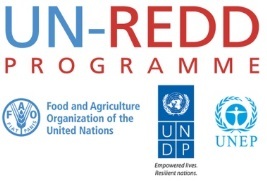 A selected group of around 35 participants from countries in each region (2-3 per country) will attend with the aim of further disseminating the gained knowledge and insights and train other relevant people who are involved in REDD+ monitoring and reporting in their country, in order to further build their capacities. The workshops will be jointly organized in close collaboration with the different training and capacity building initiatives from World Bank FCPF, GFOI, Silvacarbon, FAO/UN-REDD,REDD+ partnership, Wageningen University, GOFC-GOLD, and Boston University. Organization of the workshops will be under the coordinating leadership of Wageningen University. 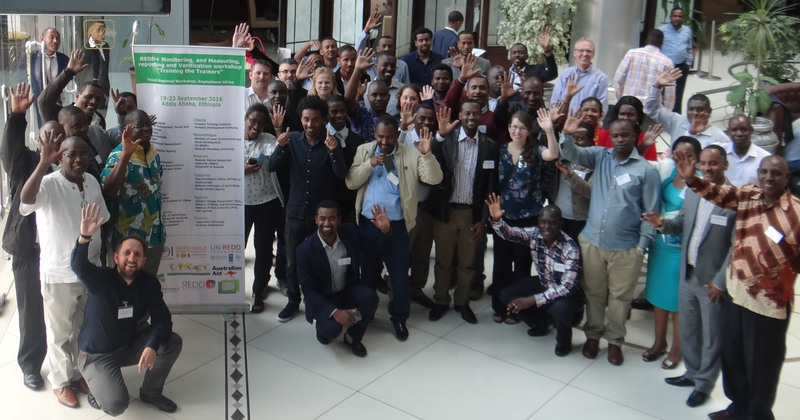 This workshop from 19 to 23 Septmber in Addis Ababa, Ethiopia, was the third of the series of four regional workshops. The aim of the workshop is to build upon existing expertise and experiences and to use available training materials and tools in a broad capacity development context to help build a countries� capacities and to spread the use and increase the impact of available knowledge and tools. After the successful completion of the workshop, participants should be able to become �multipliers� by further disseminating the knowledge and experience gained and train other relevant people who are involved in REDD+ monitoring and reporting in their country. In the workshops, participants learn about the different training materials and tools that are available and how these different materials all fit together in the �bigger picture� of REDD+ MRV capacity building. Participants will also know how and where to make request for further appropriate training and make use of available tools for implementation. A direct interaction with leading international experts present at the workshop will be facilitated so specific issues can be discussed face to face.